Asteroids are tiny planetoids orbiting the Sun in a belt between Mars and Jupiter. There are thousands of these cosmic boulders, some as little as a few meters across and some reasonably large. Ceres, the first among them to be discovered, measures about 975 km (600 miles) in diameter, so it would fit nicely into Texas and is slightly larger than France. To get back to science, the principle known as Bode's Law predicts that a planet should be found where we now see the asteroid belt, and in 1801 Giuseppe Piazzi, following Bode's formula, discovered Ceres—thinking he had found a new planet. Ceres was duly classed as a planet, just as in 1781 Uranus had been, when it was discovered in the very place Bode's Law had predicted it would be. In fact, the first four asteroids to be discovered were classified as planets, although they were later demoted to minor planets or asteroids in the 1850's, when it had become clear that there were so many of them [more on the science of Asteroids—offsite]. Speculation has it that the asteroid belt may be made up of the remnants of a large disintegrated planet; or it might be that these are the pieces from which a planet will one day coalesce. Science is unsure. The names, however, of the asteroids mostly come from the ancient græco-roman goddesses, though not consistently using either the Greek or the Roman mythologies, more a mixture of the two. Other sources have been thrown in as more asteroids are discovered, but now they are simply numbered, with Ceres being number 1. Ceres, like Pluto, has actually been reclassified by science recently, as a "dwarf planet", so interest in her astrological effects is growing rapidly, just as women are becoming more able to stand on their own feet as authentic human beings—even scientists and astrologers—in their own right! "Lo! 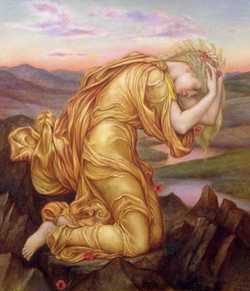 I am that Demeter who has share of honour and is the greatest help and cause of joy to the undying gods and mortal men." Ceres was originally a prehistoric Italian (possibly Etruscan) goddess of the harvest, but was later identified by the Romans with the Olympian mother goddess, Demeter. In Rome in 490 BCE, a Grecian-style temple was dedicated by the Senate as a votive offering, seeking her protection against a life-threatening drought which had been decimating the community. Her worship (performed only in the Greek tongue) was instituted using Italian priestesses of Greek extraction, as ordered by the interpreters of the Sybilline Books. These were a collection of oracular sayings in Greek, brought to Rome by the semi-mythical King Tarquin, the last king of Rome. Unfortunately they were later burnt and so lost to posterity, except for some fragments. Ceres, the great mother, the principle of unconditional love, is thus the goddess of fertility, protectress of the seasons, the harvest and the crops—we get the word "cereal" from Ceres. Her festivity, held in mid-April, was known as the Cerealia. The myth of Ceres and the loss of her daughter Proserpine (Persephone, a.k.a. Kore) explains the cyclical rhythms of nature—and the deeper mysteries of death and resurrection, the human soul and metempsychosis. Ceres and Pluto thus have a profound connection, as in mythology Pluto, dark Lord of the Underworld, abducted her daughter bright Proserpine, Goddess of Spring, thanks to the spiteful jealousy of Venus! [more on the classical myth of Ceres and Proserpine]. Ceres, daughter of Saturn and Ops (Kronos and Rhea), and sister to Jupiter, Neptune and Pluto, was also the sister of Vesta and Juno. Bountiful Ceres, queen of the mysteries, rules the cyclical structure of the natural world and the rhythms of womanhood and fertility, parenting and reproduction. Like all the ancient Olympians, Ceres represents at one level a force of nature. She has two sides, the one blessing humanity with nature's gifts and the other blighting the world by withholding her powers of fecundity. However, she also has a deeply spiritual side. The myth of Ceres and Proserpine (Demeter and Persephone) lay at the heart of Eleusinian Mysteries, initiations celebrated for more than two thousand years in the sacred groves and temples of Eleusis, near Athens—and evidence for her worship is found long centuries earlier in neolithic Crete, the earliest known European civilisation. It is interesting that Demeter, the snake-goddess, is also the goddess of the poppy. Her ancient worshippers well knew the mind-altering effects of this divine plant! The emergence of her influence in recent times has brought a resurgence of interest in the Divine Feminine, adding a dimension of awareness and nourishment. In some ways Ceres can be seen as the saviour of children, for in the myth she refuses to give up on her lost daughter Proserpine until she has been recovered and reclaimed from the Underworld. The astrological Ceres, while carrying these sacred characteristics, has nevertheless a seriously malefic side, especially when afflicted, which anyone can see from examining her position in disaster charts. Even a quick reading of the mythology also reveals that, in her sorrow and grief, she can actually blight the entire world—in order to regain what she has lost. [Hermes to Haides:] 'Zeus bids me bring noble Persephone forth from Erebos unto the gods, that her mother may see her with her eyes and cease from her dread anger with the immortals; for now she plans an awful deed, to destroy the weakly tribes of earthborn men by keeping seed hidden beneath the earth." It is true that the placement of Ceres in the chart is a harbinger of loss, but it always holds out the promise of return, or reclamation. It is interesting that Ceres was originally considered a true planet, under the auspices of Bode's Law. In fact, following the success of this principle (no longer considered a law by science) in predicting the position of Uranus, a group of 24 astronomers, including Giuseppe Piazzi, were actually looking for a proposed planet where the asteroids are now known to flock. She later lost this planetary status, but under new astronomical definitions, Ceres, the first discovered of the asteroids, has finally been reclaimed — as a "dwarf planet". She has this in common with Pluto also...! "Astrologically, Ceres describes the ways in which we face the issues of self-worth and self-esteem, relationships to our parents and children, attachment, dependency, loss, separation, rejection, grief, sharing, work and productivity." NOTE: Ceres, discovered in relatively recent times, is not a traditional planet, so has no essential dignities, and no long history of research. Interested astrologers are at variance with regard to her influence, although research is crystallizing since her promotion to a "Dwarf Planet". Modern astronomical discoveries like Ceres and the other asteroids are sometimes seized upon by those who are dissatisfied with the way traditional astrology operates, thinking that if it's new, it must be important. This approach reveals a lack of understanding of astrological principles. The new discoveries (even Pluto, Neptune and Uranus) are still under consideration and are external to the framework of astrology, even though they clearly have effects on human behaviour and significant roles in generational transitions, natural events and so on. Research is ongoing, but the jury is still out on them, as it is on Chiron, the Centaurs, the Asteroids and other notables such as the Galactic Centre, Eris and so on.